A provocative work by medical ethicist James Hughes, Citizen Cyborg argues that technologies pushing the boundaries of humanness can radically improve our quality of life if they are controlled democratically. Hughes challenges both the technophobia of Leon Kass and Francis Fukuyama and the unchecked enthusiasm of others for limitless human enhancement. 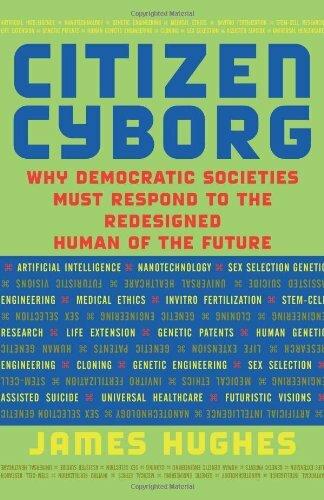 He argues instead for a third way, “democratic transhumanism,” by asking the question destined to become a fundamental issue of the twenty-first century: How can we use new cybernetic and biomedical technologies to make life better for everyone? These technologies hold great promise, but they also pose profound challenges to our health, our culture, and our liberal democratic political system. By allowing humans to become more than human – “posthuman” or “transhuman” – the new technologies will require new answers for the enduring issues of liberty and the common good. What limits should we place on the freedom of people to control their own bodies? Who should own genes and other living things? Which technologies should be mandatory, which voluntary, and which forbidden? For answers to these challenges, Citizen Cyborg proposes a radical return to a faith in the resilience of our democratic institutions.